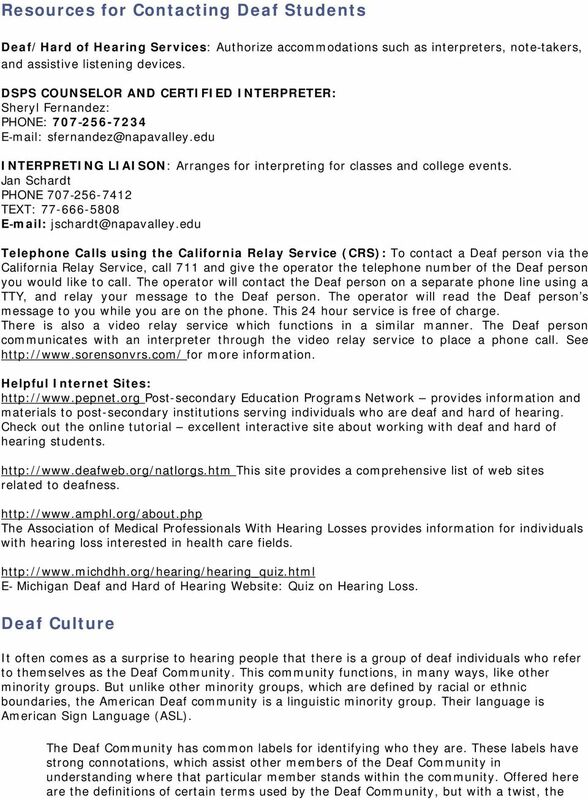 Download "Faculty Handbook for the Deaf and Hard of Hearing Program"
2 Responsibility of a Faculty Member 1. Please plan ahead As soon as you learn that a Deaf student will be in your class, make plans to ensure that all media is accessible. If you intend to show movies, slides, or video, be aware that media, as per Federal Law, must be captioned or subtitled. First, contact Media Services to find out if the movies you plan to show in class are captioned. Call Amar Abbott at or him at: with questions and to arrange for uncaptioned videos to be captioned. Providing captioning is a legal mandate and allows Deaf students to participate fully in your class. 2. 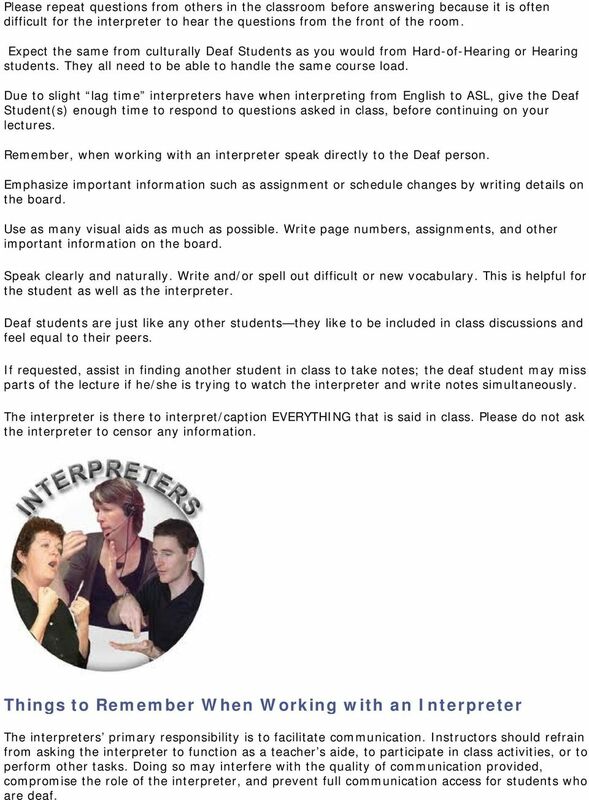 Deaf students can t watch the interpreter and also take notes, read or look at the board. Because of this, the student will need a notetaker for your class. Please assist in recruiting a qualified volunteer notetaker. If you show visual materials, please allow a few moments for students to read or look at the board before you start lecturing. The silence may be uncomfortable at first, but this could benefit all your students. Notetakers are arranged through Beverly Wirtz, Disabled Student Program Specialist at or 3. Always speak directly to the Deaf student and avoid the common mistake of saying to the interpreter, Tell the Deaf student that I said 4. Sign language interpreters are bound by a code of professional conduct and must interpret everything said and signed in class. The interpreters will not edit comments, omit information or interject their own opinions. 5. Provide important information (assignments and test dates) in writing. 6. The interpreter will wait 10 minutes for each hour of class for a late student. (15 minutes for an hour and half class, 30 minutes for a three hour class.) 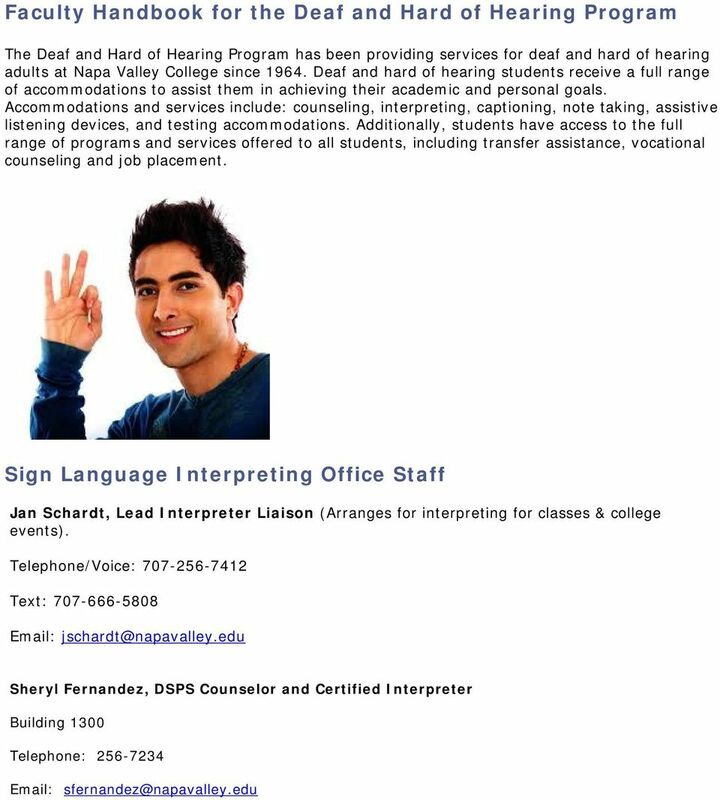 If the student shows up after that time, he/she should contact the interpreting office or text If you need to meet with a student have the student contact the Interpreting Liaison, Jan Schardt and she can make arrangements to have an interpreter available for the appointment. If there is no interpreter available for a private meeting with a student, it is fine to communicate in writing or type messages on the computer. 8. Keep in mind that English is a second language for many Deaf students. American Sign Language (ASL) is a visual language that has its own grammar and syntax. For many Deaf students learning English is difficult because they cannot hear the language but must learn it through visual means. 9. Take the time to check in with your Deaf students periodically to see how things are going for them in your class. Student Rights & Responsibilities Napa Valley College is in compliance with state regulations, Title VI and VII of the Civil Rights Act of 1964, Title IX of the Education Amendments of 1972, Section 503 and 504 of the Rehabilitation Act of 1990, and the American Disabilities Act and does not discriminate on the basis of race, color, national origin, ancestry, gender, sexual orientation, age, religious creed, marital status or disability. 3 Participation Participation in Disabled Student Program Service (DSPS) services is entirely voluntary. If you receive accommodations and/or instruction through DSPS, you are still entitled to participate in any other course, program or activity offered by the college for which you are otherwise qualified. Academic Accommodations Students with verified disabilities are entitled to academic accommodations for limitations in the educational setting from a disability. Accommodations are not authorized if they fundamentally alter the course requirements. Some examples of academic accommodations are: sign language interpreters, note taker, additional time on exams, materials in alternate format (audio, Braille, e-text), and use of a tape recorder. Each authorized accommodation is unique to each student and is based on both the diagnosis of a disability and evidence of the limitation in an educational setting. 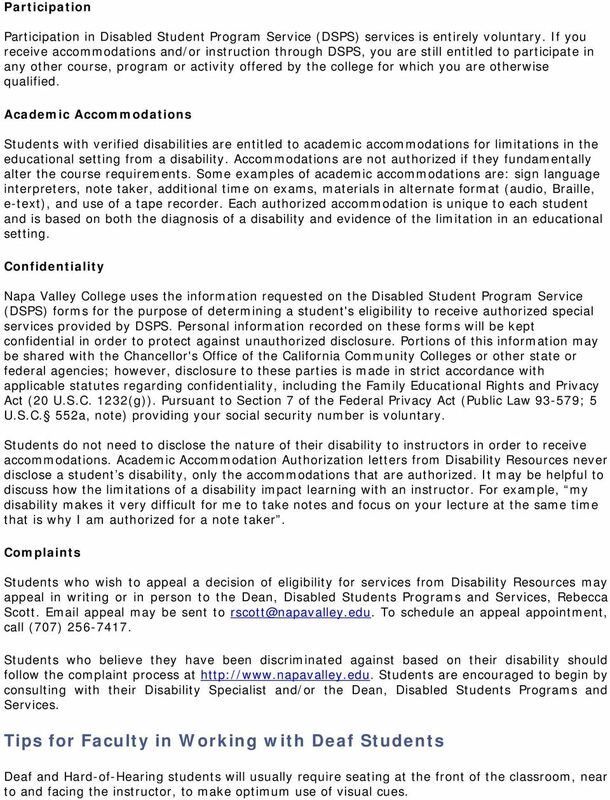 Confidentiality Napa Valley College uses the information requested on the Disabled Student Program Service (DSPS) forms for the purpose of determining a student's eligibility to receive authorized special services provided by DSPS. Personal information recorded on these forms will be kept confidential in order to protect against unauthorized disclosure. Portions of this information may be shared with the Chancellor's Office of the California Community Colleges or other state or federal agencies; however, disclosure to these parties is made in strict accordance with applicable statutes regarding confidentiality, including the Family Educational Rights and Privacy Act (20 U.S.C. 1232(g)). Pursuant to Section 7 of the Federal Privacy Act (Public Law ; 5 U.S.C. 552a, note) providing your social security number is voluntary. Students do not need to disclose the nature of their disability to instructors in order to receive accommodations. Academic Accommodation Authorization letters from Disability Resources never disclose a student s disability, only the accommodations that are authorized. It may be helpful to discuss how the limitations of a disability impact learning with an instructor. For example, my disability makes it very difficult for me to take notes and focus on your lecture at the same time that is why I am authorized for a note taker. Complaints Students who wish to appeal a decision of eligibility for services from Disability Resources may appeal in writing or in person to the Dean, Disabled Students Programs and Services, Rebecca Scott. appeal may be sent to To schedule an appeal appointment, call (707) Students who believe they have been discriminated against based on their disability should follow the complaint process at Students are encouraged to begin by consulting with their Disability Specialist and/or the Dean, Disabled Students Programs and Services. Tips for Faculty in Working with Deaf Students Deaf and Hard-of-Hearing students will usually require seating at the front of the classroom, near to and facing the instructor, to make optimum use of visual cues. 4 Please repeat questions from others in the classroom before answering because it is often difficult for the interpreter to hear the questions from the front of the room. Expect the same from culturally Deaf Students as you would from Hard-of-Hearing or Hearing students. They all need to be able to handle the same course load. Due to slight lag time interpreters have when interpreting from English to ASL, give the Deaf Student(s) enough time to respond to questions asked in class, before continuing on your lectures. Remember, when working with an interpreter speak directly to the Deaf person. Emphasize important information such as assignment or schedule changes by writing details on the board. Use as many visual aids as much as possible. Write page numbers, assignments, and other important information on the board. Speak clearly and naturally. Write and/or spell out difficult or new vocabulary. This is helpful for the student as well as the interpreter. Deaf students are just like any other students they like to be included in class discussions and feel equal to their peers. If requested, assist in finding another student in class to take notes; the deaf student may miss parts of the lecture if he/she is trying to watch the interpreter and write notes simultaneously. The interpreter is there to interpret/caption EVERYTHING that is said in class. Please do not ask the interpreter to censor any information. Things to Remember When Working with an Interpreter The interpreters primary responsibility is to facilitate communication. Instructors should refrain from asking the interpreter to function as a teacher s aide, to participate in class activities, or to perform other tasks. 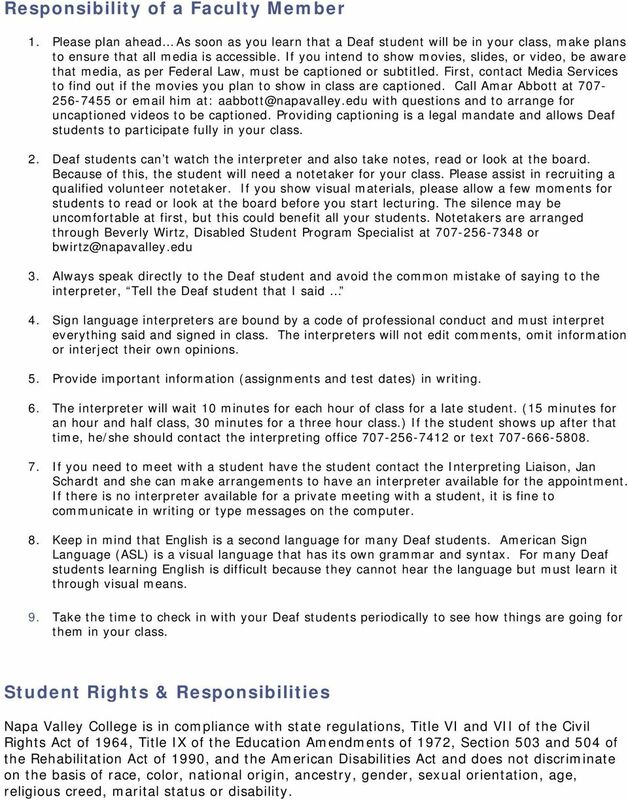 Doing so may interfere with the quality of communication provided, compromise the role of the interpreter, and prevent full communication access for students who are deaf. 5 Familiarity with the subject matter will enhance the quality of the interpreted message. If possible meet with the interpreter before class to share outlines, texts, agenda, technical vocabulary, class syllabus, and any other pertinent information. In class, the interpreter will position themselves in direct line with you, the student, and any visual aids. Interpreters process information cognitively before interpreting. The interpreted message therefore, will follow at a pace generally one or two sentences behind the communicator. Speak naturally at a reasonable pace to help facilitate an effective interpretive process. Ask students to raise their hand, be recognized, and then ask questions or give comments. This will allow the interpreter to finish interpreting for the current speaker and gives the Deaf or Hard-of-Hearing student equal opportunity to participate in class. Also, encourage the students to wait until the teacher recognizes them before speaking or signing. The interpreter can only convey one message at a time. Avoid talking while student are focused on written class work. Deaf students require time to process visual aids and materials before returning their attention to the interpreted message. Use I and you when communicating with deaf students through an interpreter. Look directly at the student with whom you are communicating, not the interpreter. Use of third-party phrases such as, Ask her or Tell him can compromise the relationship between the instructor and student. Plan some strategic breaks so that both student and interpreter can have a mental and physical break for the rigors of the situation. Receiving information visually without breaks can be tiring and cause eye fatigue. Additionally, simultaneous interpreting requires the processing of new information while the information that was just communicated by the speaker is being delivered. For classes longer than one hour in which only one interpreter is available, a mid-class break is essential. At Napa Valley College we try to provide 2 interpreters if the class is longer than 1 hour. 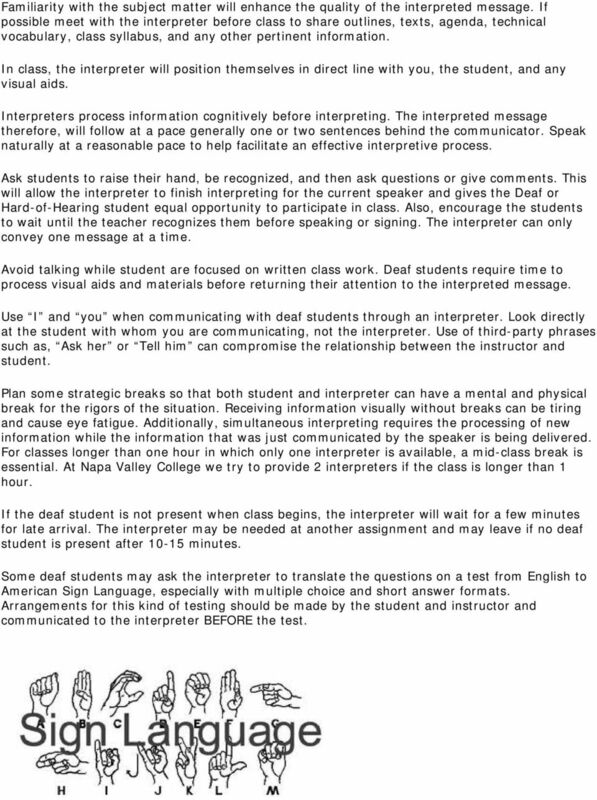 If the deaf student is not present when class begins, the interpreter will wait for a few minutes for late arrival. The interpreter may be needed at another assignment and may leave if no deaf student is present after minutes. Some deaf students may ask the interpreter to translate the questions on a test from English to American Sign Language, especially with multiple choice and short answer formats. Arrangements for this kind of testing should be made by the student and instructor and communicated to the interpreter BEFORE the test. 7 words are defined from a deaf-world s perspective. They do not define themselves based on the degree of hearing loss, like the majority of the hearing community does. Instead they focus on the individuals themselves and what communication method they prefer to use and other behavioral and cultural values and norms. For this reason, it may be different from the standard definitions that people are accustomed to understanding. 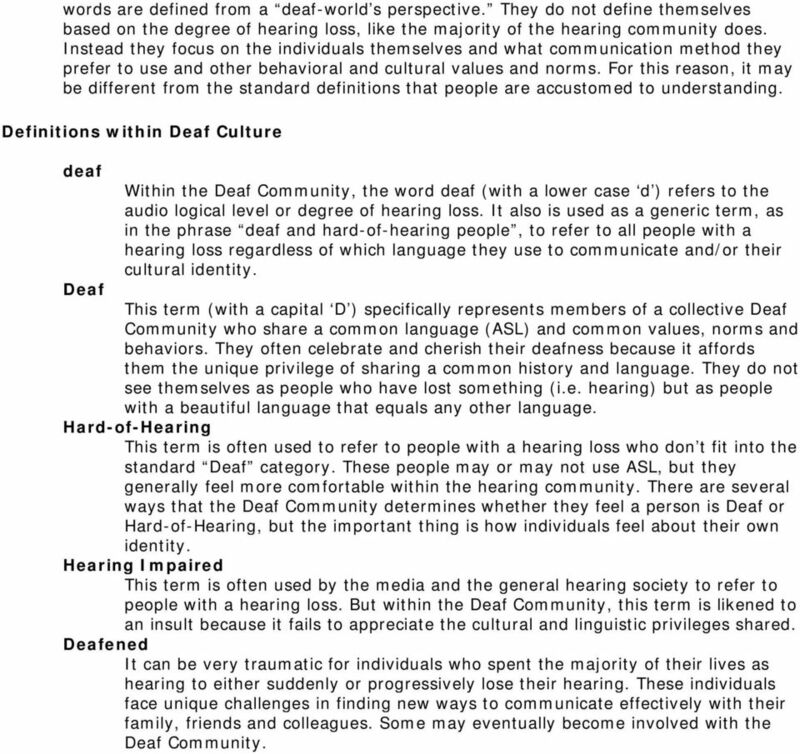 Definitions within Deaf Culture deaf Within the Deaf Community, the word deaf (with a lower case d ) refers to the audio logical level or degree of hearing loss. It also is used as a generic term, as in the phrase deaf and hard-of-hearing people, to refer to all people with a hearing loss regardless of which language they use to communicate and/or their cultural identity. Deaf This term (with a capital D ) specifically represents members of a collective Deaf Community who share a common language (ASL) and common values, norms and behaviors. They often celebrate and cherish their deafness because it affords them the unique privilege of sharing a common history and language. They do not see themselves as people who have lost something (i.e. hearing) but as people with a beautiful language that equals any other language. Hard-of-Hearing This term is often used to refer to people with a hearing loss who don t fit into the standard Deaf category. These people may or may not use ASL, but they generally feel more comfortable within the hearing community. There are several ways that the Deaf Community determines whether they feel a person is Deaf or Hard-of-Hearing, but the important thing is how individuals feel about their own identity. Hearing Impaired This term is often used by the media and the general hearing society to refer to people with a hearing loss. But within the Deaf Community, this term is likened to an insult because it fails to appreciate the cultural and linguistic privileges shared. Deafened It can be very traumatic for individuals who spent the majority of their lives as hearing to either suddenly or progressively lose their hearing. These individuals face unique challenges in finding new ways to communicate effectively with their family, friends and colleagues. Some may eventually become involved with the Deaf Community. The students are: The most important people on our campuses, without them there would be no need for us. Athens Technical College Student Support Disability Services 800 U.S. Highway 29 North Athens, GA 30601-1500 706-355-5006 / jfelts@athenstech. Postsecondary Educational Opportunities There are many opportunities for education when your child leaves the school system or graduates from high school, including traditional two- and fouryear colleges. ALL PARENTS HAVE THE FOLLOWING RIGHTS: THE RIGHT TO A FREE PUBLIC SCHOOL EDUCATION. Martine Guerrier Chief Family Engagement Officer askmartine@schools.nyc.gov Each child s maximum potential can best be achieved through an active engagement between parents 1 and the education community. Office of Disability Services. Who, When, Where, What, How, and Why? Please note this bulletin replaces Equality Bulletin 34. This definition of special education comes from the Individuals with Disabilities Education Act (IDEA), Public Law 105-17. Questions Often Asked About Special Education Services By the National Dissemination Center for Children with Disabilities (NICHCY), 1999. Public Domain. I think my child may need special help in school. Preamble. B. Specialists strive to be proficient in brain injury rehabilitation and in the delivery of services.